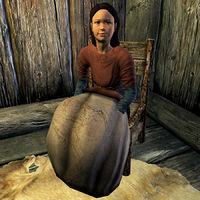 Agni is a Nord child living in Morthal. She was taken in by the resident wizard Falion after the loss of both her parents, and is currently training to be his apprentice. Due to this, she doesn't share the same opinion of him as the rest of the town. She can be seen running around with the other children early in the morning, but mostly stays with Falion in his house during the day. She gets up at 7am and stays home until 8am, when she goes outside to play. At 1pm, she returns to Falion's house and wanders around the place, sometimes conversing with Falion. Agni heads to bed at 9pm. She wears child's clothes and a pair of shoes, and is equipped with an iron dagger. She carries a key to Falion's house, a selection of food and toys, and a small amount of gold. She seems to like the idea of learning about magic and she will often ask you, "Do you like magic? Falion says I'm good at learning. I like learning about magic." She will also sadly tell you that "My mother and father died years ago. Falion takes care of me now." She wants to study magic at the College of Winterhold; however, Falion is against it. You learn of this when Agni says, "I asked Falion if someday I could learn from the mages in Winterhold, but he doesn't like that idea." Agni: "I had a bad dream again last night." Agni: "I dreamt that you went away. You made monsters." Falion: "It's just a dream, child. Nothing more." Agni: "It was scary. It was like it was real!" Falion: "Hush now. Think no more of it." Agni: "Is it true that you kill deer and eat their hearts?" Falion: "What? Where did you hear such a thing?" Agni: "I don't know. Someone in town said it." Falion: "It's not true, I assure you." Falion: "Don't believe everything you hear, child." This page was last modified on 26 February 2019, at 16:25.